As game fads go, Pokemon ranks high in terms of overall enthusiastic participation. Pokemon, unlike fads such as Furbies, found that its popularity stemmed almost entirely from the enthusiasm of the children’s market as opposed to that of their parents. Pokemon (short for pocket monster) describes the many creatures and characters that make up the Pokemon world. There are more than 150 different Pokemon creatures, each with their own name and their own personality and characteristics. The game originated in Japan (where it was created by Satoshi Tajiri) and Nintendo released the Pocket Monsters Red and Green games for the Gameboy system. The purpose of the game is to travel the world collecting one of each species of Pokemon and thus becoming the ultimate Pokemon trainer. A player can carry six creatures at a time but only one monster may be deployed at a time. You can battle against another payer by linking a cable in between the Gameboys and you can trade creatures at any time. Because each game cart contains only 139 characters, you must trade creatures with your fellow players in order to gather all of the characters (thus the Red version has certain characters and the Blue version has some characters which are different). 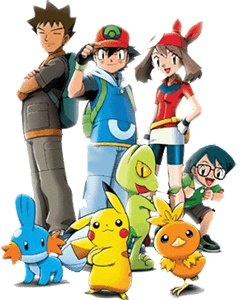 As the game grew in popularity amongst elementary-school students, a Pokemon cartoon series was released.. The popularity of the cartoon generated even more popularity in the game. The cartoon series was released in the United States even before the release of the game. This created a great demand for the game and when it was released it became the best selling game in the history of Nintendo. The cartoon eventually became the number one syndicated children’s television show in the country. Children everywhere were heard talking in Pokemon language which most adults were unable to understand. Adding more materials for the fans, Pokemon albums were released which reached the number one positions on the Billboard children’s charts and a trading card game was developed in 1999 and was bundled with with certain giveaway promotions from McDonalds. As if all of this wasn’t enough, Pokemon the Movie was released and grossed over $85 million. Pokemon-mania was running wild like nothing seen before and showed no signs of stopping. In all the Pokemon brand is worth more than $5 billion and provides fun for children across the world, With more game versions yet to come, it may continue its immense popularity and presence for years to come.